This is perhaps an exercise to begin now, but finish on another day! First run the SQL script in the above folder if necessary to create a database, if you haven't already done so. You'll also need to add the images in the above folder into your project. 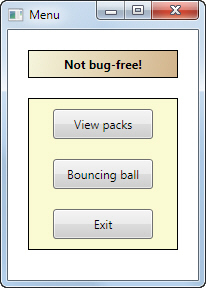 When you click on the Exit button, your menu should close; when you click on the Bouncing Ball button, you should get a suitable animation (the contents of which are left to your imagination!). You should be able to click on any item in the list, then click on OK to select it (the Cancel button should just return you to the main menu). 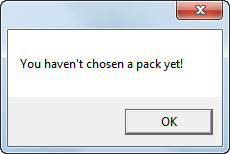 You should display a suitable message if no item is chosen. 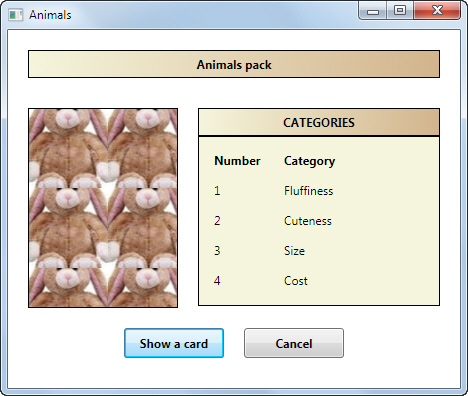 The image and categories come from the tblPack record chosen in the previous menu. See below for some notes on how this should work. 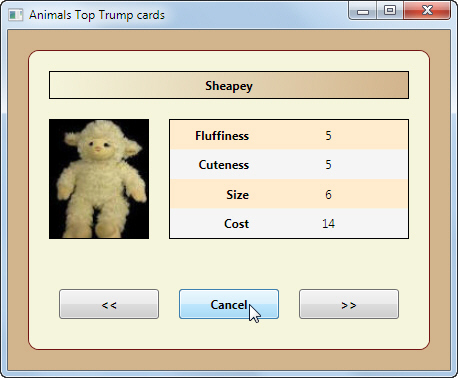 The categories and scores for the window on the previous page should come from the underlying data (you may find the view already created called vwCard useful at this point). The previous and next record buttons should take you to the previous and next card record for this pack (this is the only part of the model answer which isn't coded). For all of the windows, make sure that the Cancel buttons return you to the previous window or main menu, as you deem appropriate. 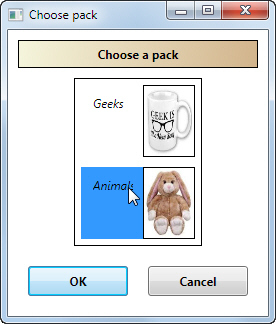 moving all formatting to styles, so that the XAML contains only the control definitions and binding. Or you could try having a go at the real system waiting for you in the office ... !